An artist's illustration of Makemake, a dwarf planet out beyond the orbit of Neptune that also qualifies as a plutoid. The powerful telescopes and spacecraft deployed to explore our solar system have paid off incredibly in recent years, uncovering all kinds of surprises about our closest neighbors. The result: a solar system that feels brand new when you look at all that's known compared to just a decade ago. The most dramatic recent news from the moon was undoubtedly the confirmation of water there last year, definitively revealed by NASA's LCROSS probe after it bombarded the lunar south pole. Although the moon is by no means wet by Earth standards, there may be more water bound to its dirt than some in of our planet's driest deserts. NASA's moon plans may now face cancellation, but much remains to be learned about the ice there. "How much there is pure ice, and how much is mixed into the dirt?" asked lunar geologist Paul Spudis at the Lunar and Planetary Institute in Houston. Answering these kinds of questions could help in any efforts to mine such ice to drive future plans for humanity in space. The unexpected discovery of water seems to be a theme with recent findings on the other inner planets of the solar system as well. NASA's MESSENGER spacecraft discovered large amounts of water present in Mercury's exosphere ? a very tenuous atmosphere. It may have arrived on comets, or arisen from interactions between the solar wind and Mercury's rock, or even come from reservoirs of ice in permanently shadowed craters at its poles. MESSENGER also confirmed the existence of volcanoes on Mercury, solving a 30-year-old mystery. Increasingly, exciting findings on Mars are shedding light on the presence of water ice under the surface of Mars away from its polar icecaps even closer to its equator than expected, as well as the history of ancient rivers, lakes and potentially oceans on the red planet. Perhaps most intriguing, however, is the possibility that Mars still harbors liquid water in underground pockets, and thus possibly any life the planet hosts. Saturn stunned astronomers with the discovery of an enormous new ring about 12.5 times the average distance between the Earth and the moon in width. This massive ring seems to consist of debris from the gas giant's distant moon Phoebe. Jupiter continues to surprise as well ? another cosmic impact marred its surface last year with a bruise roughly the size of the Pacific Ocean, further proving our solar system is a shooting gallery that sometimes blasts Earth. The mini-world Pluto was recently discovered changing colors, blushing redder from 2000 to 2002, according to the most detailed set of images ever taken of it. These likely seasonal changes are just one among many details that reveal much remains unknown about the molasses-colored dwarf planet and its distant kin. "There could be a Mars-sized or Earth-sized body hiding out there, say 300 times as far from the sun as Earth is," speculated astronomer Chad Trujillo at the Gemini Observatory in Hawaii, who helped discover the dwarf planet Eris. "The next generation of surveys in the next decade or so could produce interesting findings such as news of such planets out there." In the meantime, while the pace of discovery of new dwarf planets has slackened, with the current list at five ? Pluto, Eris, Haumea, Makemake and Ceres ? scientists are unearthing intriguing new details about the ones they have found. One intriguing recent finding is that of the Haumea family ? a group of bodies likely formed by a massive impact. "When we saw Haumea, we not only saw that it has a lot of water ice, but a dozen or so objects in similar orbits did as well," Trujillo said. The idea is that Haumea ? 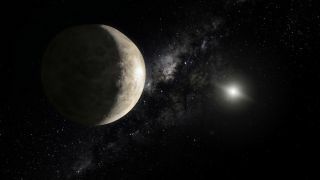 a dwarf planet one-third the size of Pluto ? and these other bodies were created by a major collision. "We always knew collisions happened, but it led to an unusual family ? Haumea has two moons, and it's spinning so rapidly that it's elongated," Trujillo said. "This gives us ideas on how the solar system might have formed. We want to see if we can find more families out in the Kuiper Belt, and learn what that might mean."